There's nothing quite like a firmware upgrade boasting plenty of new features, and that's exactly what users of QNAP's Turbo NAS series now have available. The new firmware release, version 2.1.0, is available for QNAP's TS-109, TS-209 and TS 409 NAS devices. It'll add support for two new applications; Surveillance Station and QPKG software package platform. Surveillance System does exactly what it says on the tin - it'll bring IP-based surveillance functionality and allow users to record footage from two IP cameras to the NAS without the need for a PC. If you need to keep an eye on things whilst you're away, it can be remotely configured and monitored via an IE browser, says QNAP, though, we'd imagine any browser would do. 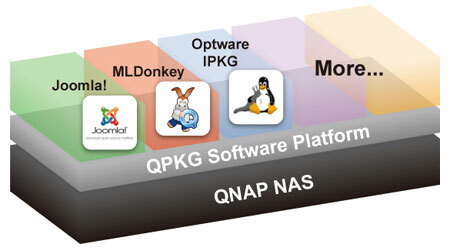 The second and more interesting application is QNAP's own QPKG platform, which will allow users to install various software applications onto their QNAP NAS device. At present, Joomla!, phpMyAdmin, MLDonkey, SlimServer (with Squeeze Center 7), and optware IPKG are available for installation with more in the pipeline. With the introduction of the Surveillance Station, we hope to bring our NAS users professional-grade yet easy-to-use network surveillance. The Surveillance Station offers versatile recording modes, including continuous recording, motion-detection recording, and schedule recording. A wide variety of camera brands are supported. By using particular models, users can use two-way video and audio monitoring and recording, wireless monitoring, and smart PTZ control to control the monitoring direction via the web interface. The Surveillance Station is a new application of the Turbo NAS series. It enables the users to monitor up to two IP cameras and record and play the video. All the functions and configurations can be carried out by the IE browser over the Internet regardless the location of the cameras. Users can flexibly define the recording settings: continuous recording, motion-detection recording, and schedule recording according to their security plan. Sound interesting? Head on over to the QNAP website where the free firmware upgrade is now available. QNAP keeps adding fancy stuff, but completely lost focus on its main target: it's a NAS. Key features no longer work correctly or at all! My main complaint is creating a backup of the NAS. I tried remote replication and copy to USB disk, and both are horribly SLOW and fail in the end. Also, spinning down disks simply doesn't work. Period. They blabber on about having services active that cause this, but it isn't: I only have FTP and samba/nfs shares active, all other fancy stuff is OFF. Even if it's the only powered device on my network, it still keeps the drives spinning. So in short: this QNAP firmware upgrade is a joke! I tried to get support via the forum but they don't even respond to my complaints.